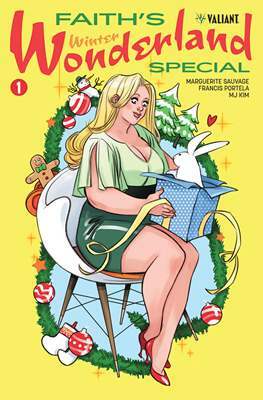 Eisner Award and Russ Manning Award-nominated artistic sensation Marguerite Sauvage (FAITH, Shade the Changing Girl) takes the helm for a fanciful tale of Faith Herbert’s very first holiday extravaganza, alongside high-spirited special guest artists Francis Portela (FAITH) and M.J. Kim (NINJAK)! As cheer fills the air, Faith “Zephyr” Herbert is about to take a trip down the rabbit hole… and into a mind-bending winter wonderland where every day is something special! But hiding behind the tinsel, all is not what it seems… White rabbit meets red-nosed reindeer as Faith squares off against a realm of make-believe and merriment for a whimsical flight of superhero fancy!